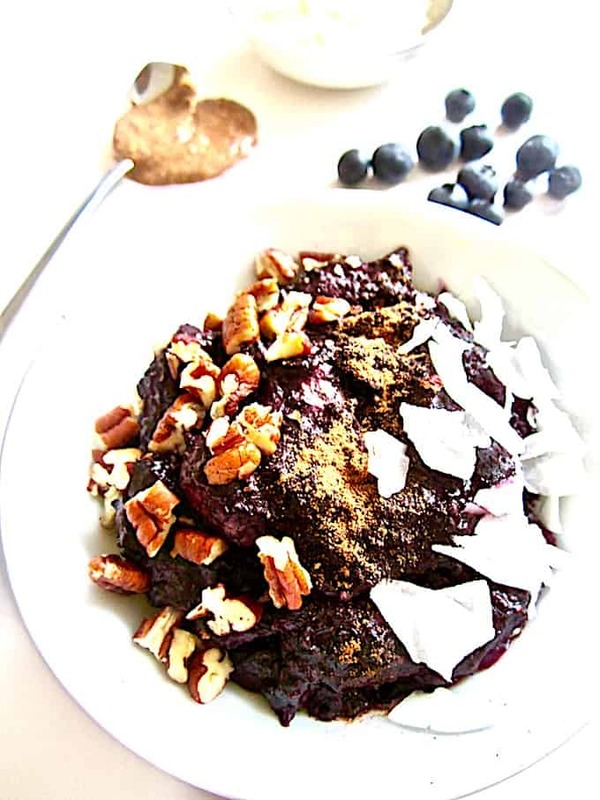 This is truly the BEST Sugar Free Berry Chia Porridge recipe! It’s satisfyingly thick (no milk needed! ), perfectly sweet with no added sugars, high in protein & ready in just 15 minutes! Simple and clean ingredients make it vegan, paleo, gluten free & grain free. Enjoy it warm or cold with your choice of toppings. This post is dedicated to my sister, Elizabeth, and brother-in-law, Kevin! They are the ones who came up with the utter deliciousness that has now become a favorite breakfast staple in all of our lives. We endearingly call it ‘poha’ after my brother David’s time in India at an ashram where he commonly ate poha for breakfast (which is the Hindi word for a simple porridge made out of flattened/beaten rice). 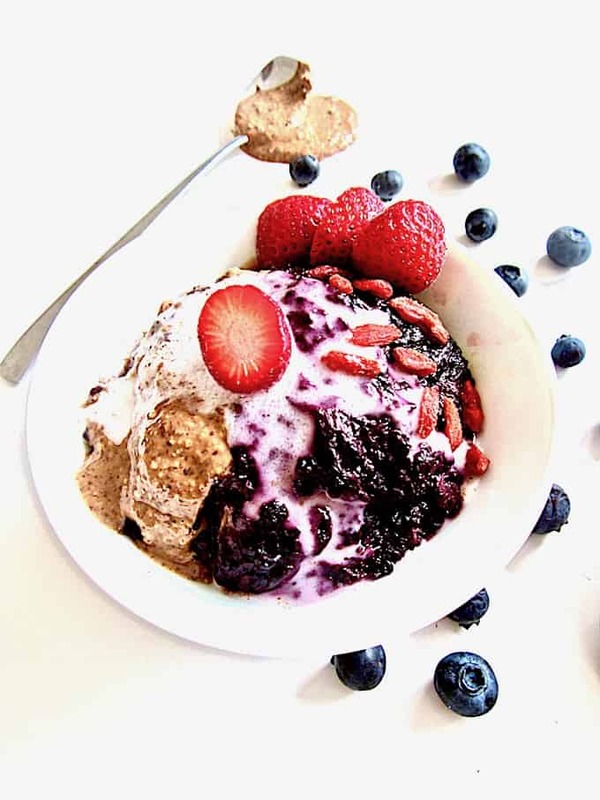 What makes this chia porridge different than the myriad of chia pudding recipes out there? It’s thick, more like a porridge than a pudding (hence the name). 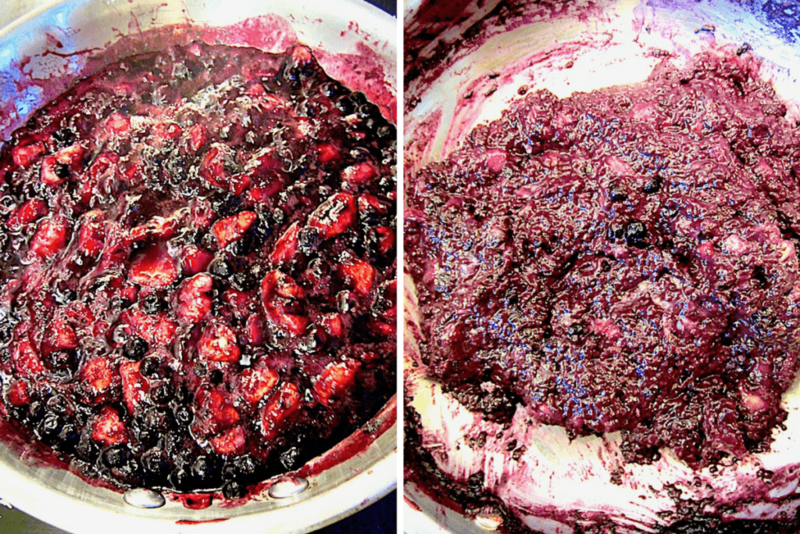 There is NO milk in this recipe – the liquid all comes from melting the frozen fruit. It’s made on the stove and ready in 15 minutes – no need to wait hours for the chia to thicken. It can be enjoyed warm or cold as leftovers. It’s super clean and healthy – vegan, gluten free, paleo, grain free, soy free, sugar free and even nut free if you substitute sunflower seed butter or other seed butter in place of the almond butter (which I have not tried, but I’m sure it would work!). It’s purple! I mean really, how often do you see purple food?! Other than eggplant, grapes and cabbage, really not that often, huh? I didn’t make the decision lightly to call this ‘the best’ in the recipe title, but I couldn’t help myself because I truly think it’s a mini masterpiece. 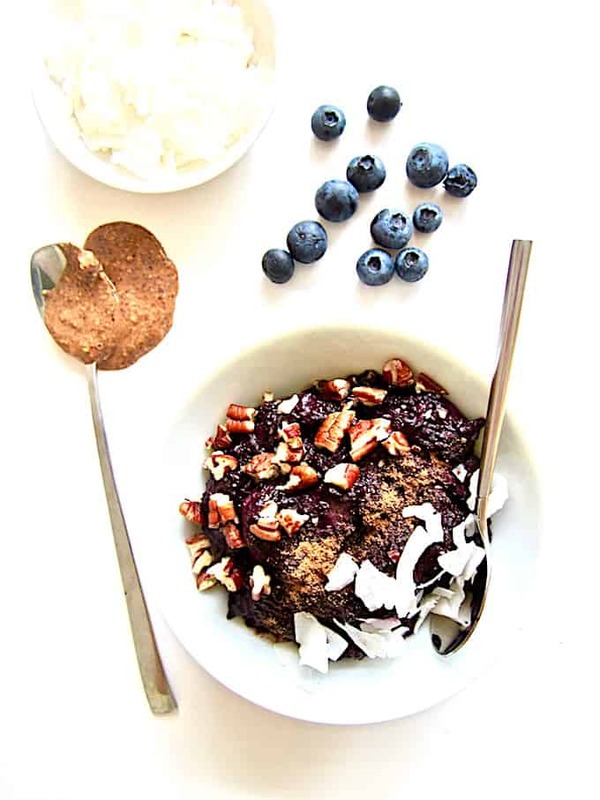 How often do you get a satisfyingly warm, healthy and sweet breakfast without any added sugars or at least some stevia? So what’s in this porridge? Bananas, frozen berries (any kind – I used blueberries but you can used mixed berries, raspberries, strawberries, whatever! ), chia seeds, almond butter, salt and cinnamon. That’s it! Here’s what you do: chop the bananas and warm them in a pan along with the frozen berries. The berries will start to melt, creating a liquid. It will look like the left photo below. The bananas then also start to meld into the mixture. This makes 2-3 servings in total. If you divide it in two, you get 8.4 grams of protein per serving + a whopping 14.9 grams of fiber! If you divide it in three, you get 5.6 grams of protein per serving + 9.9 grams of fiber (and these numbers of course don’t account for any additional toppings you may add like nuts or nut butter that increase the protein count). Those of you who read this blog regularly know that I’m a toppings kind of girl. I love variety and typically mention topping options galore that you can add on to my recipes to add different textures and flavors and really make the recipe your own. When I have dinner with Elizabeth and Kevin we usually have an entire cornucopia of toppings on the table so we can explore different flavors with each bite (think seasonings, spices, fresh herbs, sauces, nuts/seeds, nutritional yeast, hot sauce, etc.). Can anyone else relate to having a toppings obsession? ? Raise your hand! ? 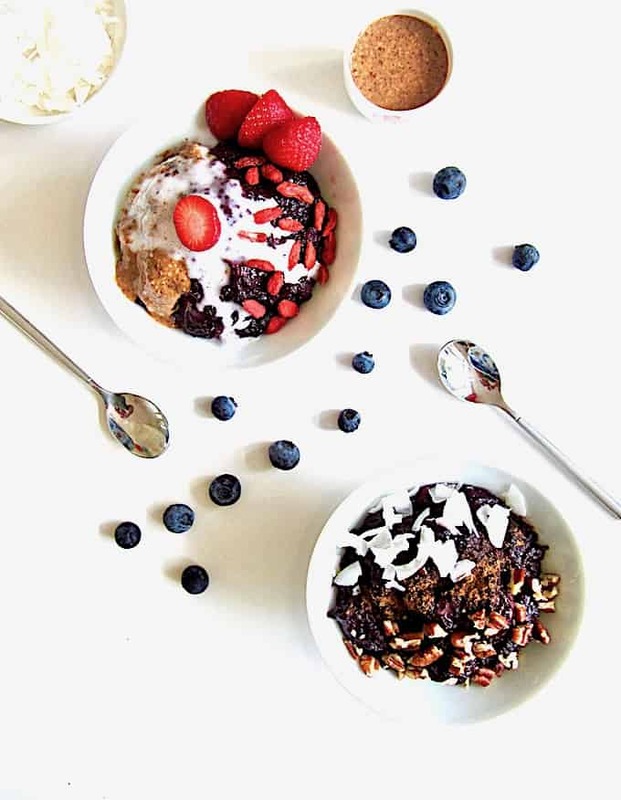 In the pictures you’ll see that one porridge has pecans, coconut flakes and cinnamon. The other has strawberries, goji berries, almond butter and coconut yogurt. Abbot Kinney yogurt is thick, creamy and sweet. It has probiotics and no sugar, gluten or soy. In fact, I even reached out to the company last week to share my adoration and ended up going to their office here in Amsterdam to pick up some free yogurt. Yes! The perks of being a food blogger… 😉 I’ll certainly be missing Abbot Kinney’s when I go back to the States! So – how will you enjoy this poha? 🙂 While I typically eat it for breakfast, you can also have it as a snack or even dessert! 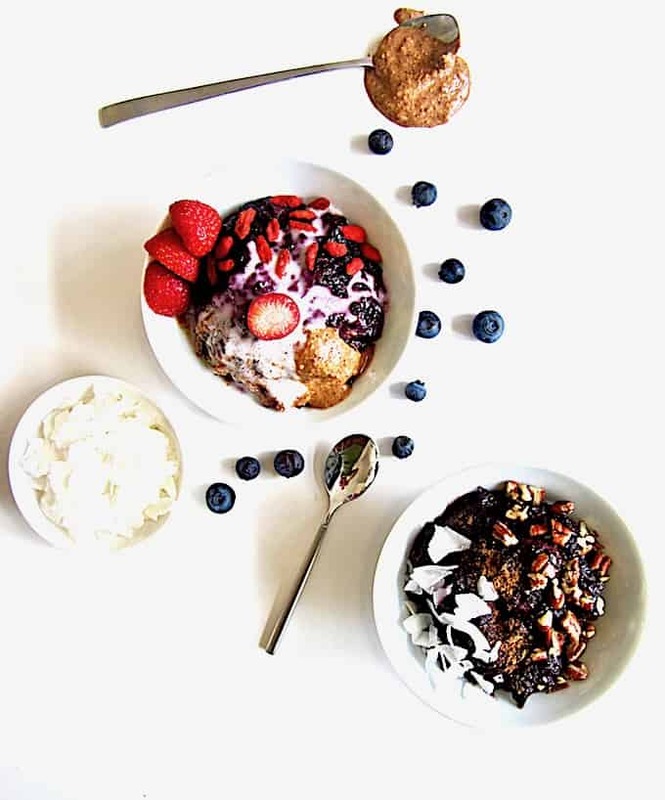 Let me know in the comments below what other creative topping ideas you have and your favorite ways to enjoy chia pudding or porridge! This satisfyingly thick porridge (no milk needed!) 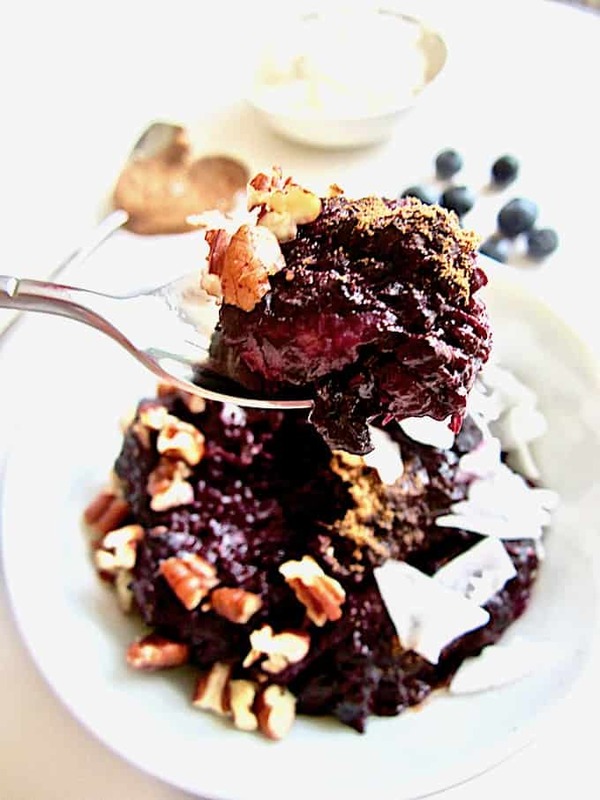 is perfectly sweet with no added sugars, is high in protein & ready in just 15 minutes! 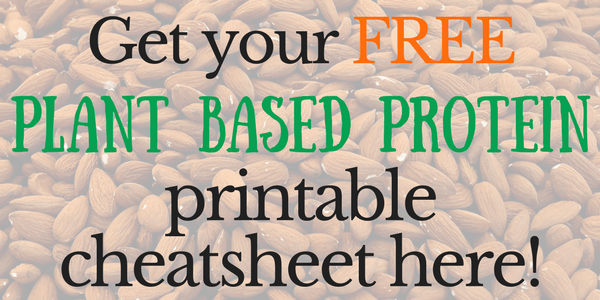 Simple and clean ingredients make it vegan, paleo, gluten free & grain free. Enjoy it warm or cold with your choice of toppings. Place your skillet on medium heat. Add the bananas and berries and bring to a simmer. Let simmer for about 5 minutes, stirring occasionally. The berries will start to melt, creating a liquid. The bananas will also start to melt into the mixture. Next, add in the almond butter, chia seeds, salt and cinnamon. Stir well to combine all ingredients, and continue to stir regularly. The porridge will start to thicken. It's ready once all ingredients have combined to make a thick, sticky mixture with no excess liquid. Serve warm and add any toppings you desire. Also saves well in the fridge as cold leftovers the next day! *The riper the bananas, the sweeter this porridge will be, so I recommend very ripe ones! This truly sounds amazing! Do you think frozen bananas would work? I have quite a few in the freezer. Otherwise ill just go get some more. :). I've got the rest of the ingredients and am looking forward to tasting. Hi Heidi. YES you can definitely use frozen bananas. We do it all the time :) I feel like it comes out even sweeter, because of the "syrup" the frozen bananas produce. We use frozen berries often, too! ENJOY! Looks so delicious! And it's so pretty with the berries. Pinning for later! I love the idea of using just the juicy fruits for the liquid! Nothing better than a hearty bowl of goodness in the morning. Definitely need to give this a try! Thanks Jenn - yes, the fruit juice is pretty magical - I hope you love it! Now this looks like a breakfast worth waking up to! Love the pure healthiness of it! Too good! This is indeed a masterpiece - I am not surprised you couldn't help yourself ha ha. A wonderful stroke of genius at work there. 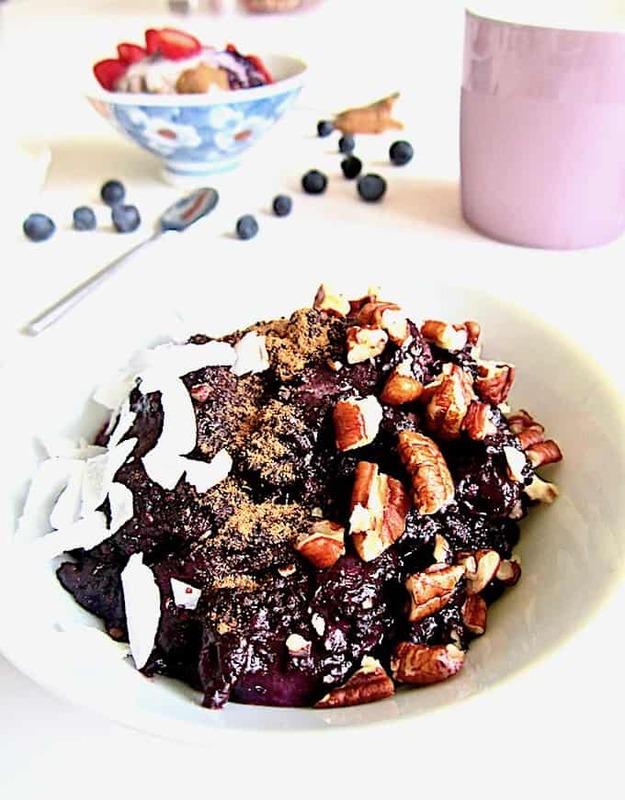 Sounds a-a-a-mazing (and super healthy too yay!). This looks so healthy AND delicious! Thank you for sharing, I love how quick and easy it is. Yum, cherries and chia seeds! This is the perfect summer breakfast. Heard a lot of good stuff about chia seeds, have never tried them. But this color is awesome it makes me to give a try. A day start with such colorful breakfast is worth nothing else i think! Oh my goodness you MUST try chia seeds! They are one of my favorite foods. :D Thanks for your kind words! Hi Francesca - Ooh, thanks so much for including me! So glad to hear that you loved the recipe :D If you tag me in the post on social I'd be happy to share! (If you already did - I must have missed it so please tag me again.) Thanks!